In early February, the American Samoa Community College (ASCC) received official correspondence from the Accrediting Commission for Community and Junior Colleges (ACCJC), a subsidiary of the Western Association of Schools and Colleges (WASC), stating that the Commission, during its January meeting, has taken the action pertaining to ASCC of "Removed Show Cause and Issued Warning on the Basis of a Show Cause Report with Visit." This comes 12 months after WASC-ACCJC issued a “Show Cause” sanction to ASCC in February 2015. The WASC-ACCJC website describes the Warning sanction as action taken when "the institution has acknowledged serious noncompliance, has demonstrated affirmative steps, and plans to fully resolve the deficiencies within twelve months.” The Commission specifies the time within which the institution must resolve the deficiencies and demonstrate compliance, generally twelve to eighteen months. During the Warning Period, the institution will be subject to reports and visits at a frequency to be determined by the Commission. The accredited status of the institution continues during the Warning Period. Actions on sanctions that are issued by WASC-ACCJC include: (1) Warning, (2) Probation, and (3) Show Cause precluding Commission actions to withdraw accreditation from an institution. The Commission modifying the Show Cause sanction to Warning marks a highly significant action indicating the progress ASCC has made and affirmative steps it has taken to address the concerns specified by WASC-ACCJC following a 2014 site visit which precluded the issuing of the Show Cause sanction in February 2015. Upon receiving Dr. Beno’s correspondence, then-Acting ASCC President Dr. Rosevonne Makaiwi-Pato, on behalf of President Dr. Seth Galea’i, shared the news with the College’s faculty and staff, although public notice was not made until the Board of Higher Education were informed of the WASC-ACCJC action at their most recent meeting. 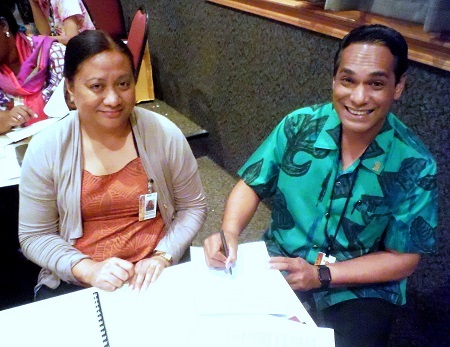 “I want to thank the entire institution for your dedication, commitment, collaboration, student centeredness, and respect for one another throughout the Show Cause sanction period,” wrote Dr. Makaiwi-Pato in a memo to the many ASCC stakeholders who had participated in the year-long effort to address compliance issues.